The Firestone FR710 tire is an all season radial that is M+S rated and provides drivers with an economical replacement to their original equipment tires. The tire itself features a tread design that provides for reliable handling and traction dry pavement, as well as rain covered roads due to the L.L. Carbon black that is built into the tread compound. 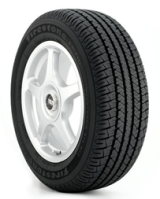 You can get this Firestone model in H, S or T speed ratings, and it comes in most all widths and heights. With a wider footprint and UNI-T construction, this tire will suit most tastes. Because this tire is so economically priced, it makes it an ideal option for those on a tight budget. And with a 65,000 mile tread warranty it also is a very good value. Prices on the FR710 tires range from a low of around $70 for the 14″ series, to upwards of $150 for the much larger 17 and 18 inch models. Who Are Firestone FR710 Tires Designed For? Firestone has designed the FR710 primarily as an original equipment replacement tire on coupes, sedans, minivans and other types of vehicles for drivers looking for an all-season radial tire with good tread wear and value for the money. Firestone tires backs up the FR710 with a 5 year or 65,000 tread wear warranty. You can also expect to find a first 1/32″ of wear uniformity guarantee, as well as a 5 year guarantee on materials and workmanship. It provides for free replacement for the first 3 years as long as there is at least 2/32″ of useable tread left on the tire. Firestone also includes a 30 day buy it and try it guarantee whereby you can either get a full refund or exchange the tires for another Firestone tire.